Beautiful 18 karat gold plated Shree Yantra Sacred Geometry symbol. Size: 2.84 inches in diameter by .02 inches (same thickness as a credit card). The pattern is on both sides. 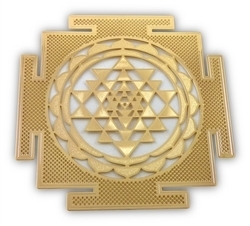 The Shree Yantra is one of the most auspicious, important and powerful Yantras. Shree meaning wealth and Yantra - Meaning "Instrument". Hence it is recognized to aid in spiritual and material wealth. The mystic symbol that has been revered since ancient times of the Shree Yantra is a source of energy represented in the shape of waves and rays, partly in the form of 9 triangles that are perfectly placed. As such it is a symbol of magnificent magnetic powers. The Shree Yantra is connected deeply with the Ancient Art of Vaastu and has been specifically mentioned in the 'Vaastu Shastra's. All constructions based on Vaastu must essentially have a Shree Yantra in them. The Vedas explain Shree Yantra as a scientific, cosmic and planetary energy zone. Having a sacred geometry symbol like the Shree Yantra in your house (which should be respectfully placed in an appropriate location) is believed to attract both spiritual and prosperous blessings.